The parish of Surlingham is situated in south Norfolk. It lies west of Strumpshaw, north of Rockland St Mary, south of Brundall and Postwick, and east of Bramerton. The name Surlingham may derive from the Old English meaning ‘southern homestead of Herela’s people’. The parish has a long history and was well established by the time of the Norman Conquest. Its population, land ownership and productive resources were detailed in the Domesday Book of 1086. This document revealed that Godric the Steward held the lands here after the Conquest. It also lists various agricultural resources. The first archaeological site to be identified may be of Bronze Age date. Aerial photographs show the cropmarks of several circular features, and these may be ring ditches that related to the round barrows that are characteristic of this period (NHER 18336). The nature of the Bronze Age finds from Surlingham may also suggest that it was a place of importance at this time. A hoard of three copper alloy axeheads (NHER 10245) is on record as are other metal artefacts like a dagger (NHER 10247) and spearhead fragments (NHER 35835) and items like these represent significant finds. Sadly, very few finds dating to the Iron Age have been discovered in the parish. 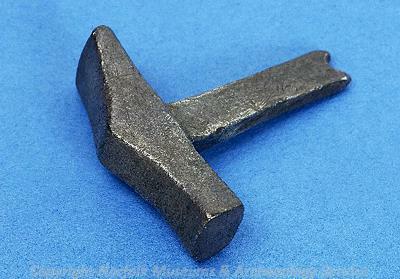 A pin belonging to a buckle or brooch (NHER 31391) comprises one of the few Iron Age objects to have been found. The majority of Roman finds have been recovered through metal detecting. Along with the mundane objects like coins (e.g. NHER 10247), pottery sherds (e.g. NHER 12887) and brooches (NHER 31275 and 35079) were several more interesting items. These finds comprised part of a silver bracelet (NHER 31655), an elaborate strap distributor (NHER 36820), a hairpin (NHER 35077) and the fragment of a patera used for drinking wine (NHER 31391). Although there are no Saxon sites recorded for Surlingham, there are a good number of Saxon artefacts. Several of these are very fine indeed, and perhaps constitute the best artefacts from any period to have been recovered. 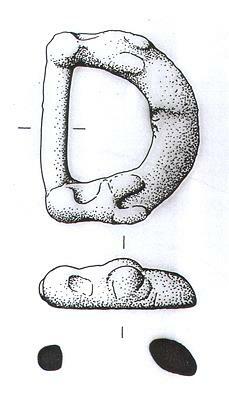 Finds from the Early Saxon period comprise a girdle hanger (NHER 31275) and a possible spangle (NHER 36820). Two fine brooches, one of the ansate type (NHER 31997) and the other decorated with a backwards-turning beast (NHER 35077), have been dated to the Middle Saxon period. 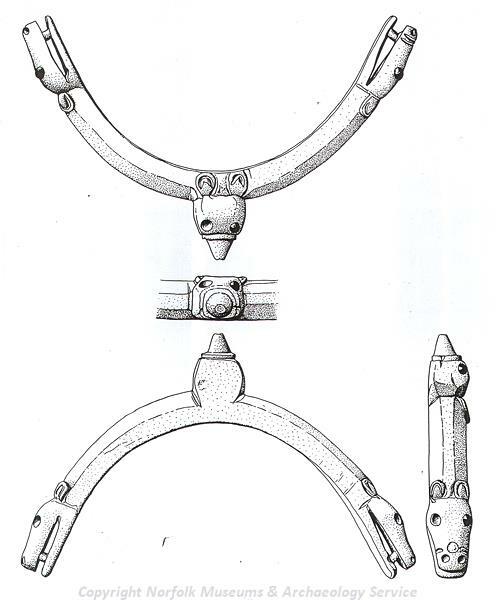 The superb finds from the Late Saxon period consist of a Ringerike style mount from horse equipment (NHER 31391), a silver Thor’s hammer pendant (NHER 31655), an Anglo Scandinavian stirrup strap mount (NHER 35079) and a tiny folding balance (NHER 31390). It is unclear why these beautiful objects are present, but they may suggest some sort of Saxon occupation or trading in the area. During the medieval period two churches existed in Surlingham. St Mary’s (NHER 10136) still survives and is notable for its Norman round tower, although much of the exterior owes its appearance to 18th and 19th century restorations. Inside, the carved octagonal font is in the Perpendicular style and the unusual wooden lectern, in the form of an eagle perched atop an owl, is very interesting. The other church, dedicated to St Saviour, is now ruinous (NHER 10140). It dates to the 12th century and consists of a nave with a chancel. Recently, efforts have been made to conserve the remaining stonework, which includes a brick archway and sections of the porch. A study of the environment around Surlingham Broad (NHER 13522) also shows that the medieval inhabitants were engaged in peat cutting. The peat would have been a very valuable resource, and made for excellent fuel. A diverse range of medieval objects have been recovered from the parish, in fact rather too many to mention here in detail. The most intriguing finds comprised a seal matrix of William de Multon (NHER 31656) who was a member of the seigniorial family of Surlingham manor, a buckle plate decorated with a lion motif (NHER 35079), a belt mount in the shape of a shell or wheatsheaf (NHER 31997) and a nicely gilded strap end (NHER 31391). The records detailing post medieval Surlingham show that a number of industrial sites were present in the parish. The locations of two possible brickworks have been identified (NHER 10245 and 30635). Similarly, two windmills were in operation (NHER 15579 and 15580) and were shown on Faden’s map of 1797. Two former inns and public houses of post medieval date have been listed as properties of architectural interest. Ferry House Inn (NHER 10138) dates to 1725 and has a whitewashed exterior, whilst Coldham Hall (NHER 40331) with its thatched roof was a private dwelling before becoming a public house. Of course, the most impressive building to be erected was Manor House (NHER 15322), which began life as a single storey timber framed house with 17th century firegables. A crosswing was added in 1736 and the older building was replaced in brick around 1770, and given an upper storey in the 19th century. As one would expect in a rural parish, a number of post medieval agricultural buildings also survive; taking the form of farmhouses (NHER 45521), cottages (NHER 10137 and 45522) and barns (NHER 10139). A number of post medieval metal objects, coins and pottery sherds have been recovered from Surlingham. Finds that merit a mention include a pewter whistle (NHER 22339), a 16th century silver seal matrix with a swan motif (NHER 31275), a hooked tag decorated in relief with leaves (NHER 31655), a belt mount in the shape of two back to back fleur-de-lis (NHER 31997) and a gold finger ring (NHER 35077). It is also worth noting that a number of items relating to trading (see for example NHER 50013) have been recovered from Surlingham, which perhaps suggests that the trade in the village was thriving during this period. The most recent archaeological record concerns the Surlingham decoy airfield and ‘Bramerton’ bombing decoy (NHER 13608). The decoy airfield was used during World War Two for diverting raids on the Norwich and Stoke airfields. The airfield extended into Bramerton parish to the south, and incorporated a 'Starfish' to imitate Thorpe railway station with lights aligned along the 'rails'. This part of the decoy was known simply as ‘Bramerton’. Little remains of the airfield/decoy now, although a concrete bunker was still standing when the site was visited in 1977. Thomas Sunley (NLA) 28 June 2007.